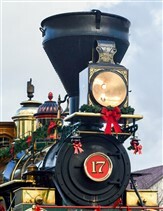 Join Martz for The Christmas Train Ride tour in York County. FUN for the whole family !! Factory. This masterpiece of archicture is just full of history ! 12:15 pm - 1:30 pm Enjoy a hot served lunch at the Dutch Country Kitchen in Hanover, specializing in homemade Penn Dutch Favorites. 1:45 pm - 2:30 pm Visit the Utz Potato Chip Outlet store for browsing. 2:30 pm to 3:15 pm Travel time to New Freedom for the holiday train ride ! 5:30 pm Following this fun filled day, we will now depart for home. We will make a fast food stop (on own) on the way home.